Ronald Orlaf FARR [Parents] 1-10403 was born 2 on 26 Jun 1917 in Farmington, Davis, Utah, United States. He died 3 on 22 Jul 1972 in Santa Barbara, California, United States. Ronald married 4 (MRIN:4481) Marion P. DREDGE-10404 on 8 Aug 1937 in Whitman, Washington, United States. Constance Meredith "Connie" FARR (GIBSON) [Parents]-10408. Keith Lynn FARR (GIBSON) [Parents] 1-10410 was born 2 on 11 Aug 1929 in Huntington Park, Los Angeles, California, United States. He died 3 on 12 Mar 2011 in West Hills, Los Angeles, California, United States. Keith married (MRIN:4483) Beverly Ann CARLSON-10411 on 24 Jun 1950 in Pasadena, Los Angeles, California, United States. Keith was counted in a census 4 in 1940 in Denver, Denver, Colorado, United States. CENSUS: Not on sheet 9A with family but is on sheet 13 B as a continuation. Richard Keith FARR-11442 was born 1 on 6 Apr 1955 in Santa Barbara, California, United States. He died 2 on 1 Mar 1975 in Rosemead, Los Angeles, California, United States. Raymond Stanley WIGGINS 1-10413 was born on 30 Apr 1898 in Ogden, Weber, Utah, United States. He died on 24 Sep 1960 in Castle Rock, Summit, Utah, United States. He was buried on 27 Sep 1960 in Ogden, Weber, Utah, United States. Raymond married (MRIN:4484) Rhea FARR-10412 on 14 Mar 1918 in Salt Lake City, Salt Lake, Utah, United States. Rhea FARR [Parents] 1-10412 was born on 16 Jun 1897 in Ogden, Weber, Utah, United States. She died on 24 Sep 1960 in Castle Rock, Summit, Utah, United States. She was buried on 27 Sep 1960 in Ogden, Weber, Utah, United States. Rhea married (MRIN:4484) Raymond Stanley WIGGINS-10413 on 14 Mar 1918 in Salt Lake City, Salt Lake, Utah, United States. Charles Lorenzo FARR [Parents] 1-10414 was born 2 on 10 Jan 1883 in Ogden, Weber, Utah, United States. He died 3 on 26 Oct 1964 in Atascadero, San Luis Obispo, California, United States. Charles married (MRIN:4485) Nina M. PRATO-10415 in May 1911 in Ogden, Weber, Utah, United States. The marriage ended in divorce. Charles was counted in a census 4 in 1900 in Ogden, Weber, Utah, United States. Nina M. PRATO 1-10415 was born in 1890 in Michigan, United States. Nina married (MRIN:4485) Charles Lorenzo FARR-10414 in May 1911 in Ogden, Weber, Utah, United States. The marriage ended in divorce. Nina was counted in a census 2 in 1910 in Bay City, Bay, Michigan, United States. Charles Lorenzo FARR [Parents] 1-10414 was born 2 on 10 Jan 1883 in Ogden, Weber, Utah, United States. He died 3 on 26 Oct 1964 in Atascadero, San Luis Obispo, California, United States. Charles married (MRIN:4486) Vivian CALDWELL-10416 on 15 Mar 1927 in Ventura, Ventura, California, United States. Vivian CALDWELL-10416 was born in Cal 1887 in Ogden, Weber, Utah, United States. She died in California, United States. Vivian married (MRIN:4486) Charles Lorenzo FARR-10414 on 15 Mar 1927 in Ventura, Ventura, California, United States. Adrian Lorin FARR [Parents] 1-10417 was born 2 on 28 Mar 1885 in Ogden, Weber, Utah, United States. He died 3 on 5 Jun 1960 in Twenty-Nine Palms, San Bernardino, California, United States. He was buried in Jun 1960 in Twenty-Nine Palms, San Bernardino, California, United States. Adrian married 4, 5 (MRIN:4487) Paula GLEERUP-10418 on 16 Jun 1911 in Brigham City, Box Elder, Utah, United States. Adrian was counted in a census 6 in 1900 in Ogden, Weber, Utah, United States. Paula GLEERUP 1-10418 was born on 11 Aug 1890 in Denmark. She died on 27 Feb 1979 in Burbank, Los Angeles, California, United States. She was buried on 2 Mar 1979 in Valhalla Memorial Park, Los Angeles, California, United States. Paula married 2, 3 (MRIN:4487) Adrian Lorin FARR-10417 on 16 Jun 1911 in Brigham City, Box Elder, Utah, United States. 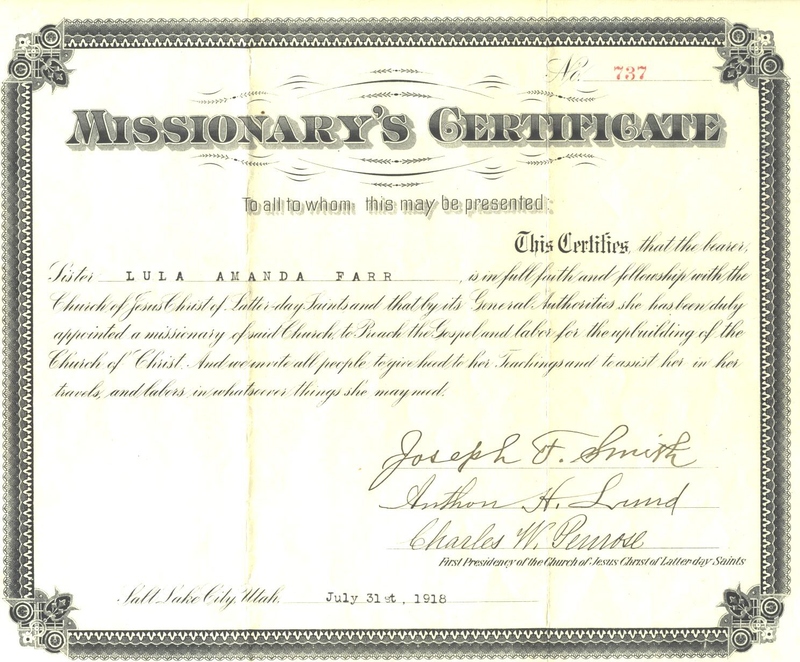 Paula was counted in a census 4 in 1910 in Brigham City, Box Elder, Utah, United States. M i Glenn A FARR-11247 was born on 5 May 1912. He died on 18 Oct 1994. Wendell Oliver FARR-11248 was born on 20 Feb 1914 in Ogden, Weber, Utah, United States. He died in 1933. Wendell was counted in a census 1 in 1920 in Ogden, Weber, Utah, United States. F iii Adele P. FARR-11254 was born on 2 Oct 1920. She died in Jul 1995. Winifred FARR-11246 was born on 11 Nov 1923 in Ogden, Weber, Utah, United States. She died 1 on 10 Apr 1924 in Weber, Utah, United States. Issac RUSSELL Jr 1-10420 was born 2 on 14 Dec 1879 in Salt Lake City, Salt Lake, Utah, United States. He died 3 on 7 Sep 1927 in Chicago, Cook, Illinois, United States. Issac married 4 (MRIN:4488) Eleanor Althea FARR-10419 on 26 Jun 1907 in Salt Lake City, Salt Lake, Utah, United States. 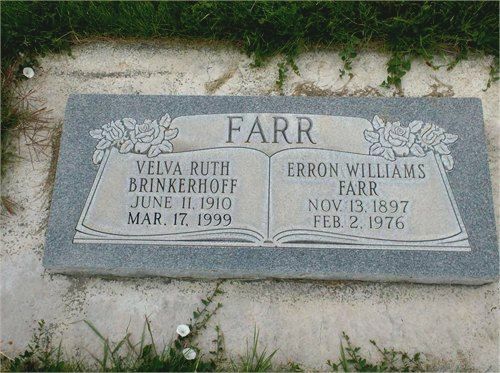 Eleanor Althea FARR [Parents] 1-10419 was born on 2 May 1887 in Ogden, Weber, Utah, United States. She died on 5 Sep 1935. She was buried in Sep 1935. Eleanor married 2 (MRIN:4488) Issac RUSSELL Jr-10420 on 26 Jun 1907 in Salt Lake City, Salt Lake, Utah, United States. Eleanor was counted in a census 3 in 1900 in Ogden, Weber, Utah, United States. MARRIAGE: Marriage record says Weber, Utah but they were sealed in the Salt Lake Temple the same say in Salt Lake City. Frank Elmer TRIBE 1-10422 was born 2 on 1 Aug 1885 in Ogden, Weber, Utah, United States. He died 3 on 12 Mar 1956 in Provo, Utah, Utah, United States. He was buried in Mar 1956 in City Cemetery Ogden, Weber, Utah, United States. Frank married 4 (MRIN:4489) Helen Olivia FARR-10421 on 26 Jul 1911 in Ogden, Weber, Utah, United States. 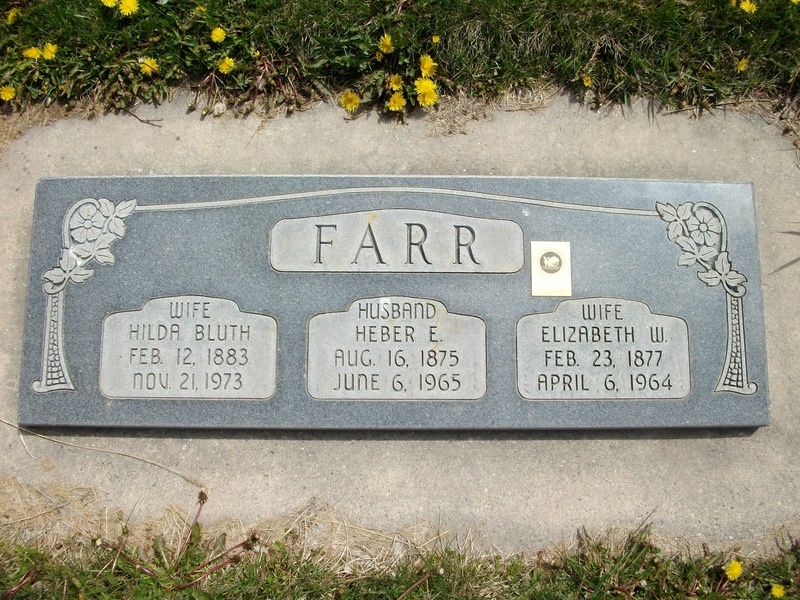 Helen Olivia FARR [Parents] 1-10421 was born on 31 May 1889 in Ogden, Weber, Utah, United States. She died on 22 Mar 1977 in Logan, Cache, Utah, United States. She was buried on 28 Mar 1977 in City Cemetery Ogden, Weber, Utah, United States. Helen married 2 (MRIN:4489) Frank Elmer TRIBE-10422 on 26 Jul 1911 in Ogden, Weber, Utah, United States. Helen was counted in a census 3 in 1900 in Ogden, Weber, Utah, United States. Ralph Woodmansee FARR [Parents] [scrapbook] 1-10423 was born 2 on 1 Aug 1892 in Ogden, Weber, Utah, United States. He died 3 on 28 Jun 1971 in Ogden, Weber, Utah, United States. He was buried on 1 Jul 1971 in City Cemetery Ogden, Weber, Utah, United States. Ralph married 4 (MRIN:4490) Artimesia WOOLLEY-10424 on 16 Apr 1910 in Logan, Cache, Utah, United States. Ralph was counted in a census 5 in 1900 in Ogden, Weber, Utah, United States. Artimesia WOOLLEY [scrapbook] 1-10424 was born 2 on 5 Jan 1894 in Kane, Utah, United States. She was christened on 13 Jan 1894 in Kanab, Kane, Utah, United States. She died 3 on 2 Feb 1974 in Ogden, Weber, Utah, United States. She was buried on 6 Feb 1974 in City Cemetery Ogden, Weber, Utah, United States. Artimesia married 4 (MRIN:4490) Ralph Woodmansee FARR-10423 on 16 Apr 1910 in Logan, Cache, Utah, United States. Artimesia was counted in a census 5 in 1910 in Logan, Cache, Utah, United States. M i Vernon Carlyle FARR-10425 was born on 19 Mar 1911. He died on 28 May 1989. Ralph Dilworth FARR [scrapbook] 1-10427 was born on 24 Oct 1914 in Ogden, Weber, Utah, United States. He died 2 on 28 Nov 1914 in Ogden, Weber, Utah, United States. He was buried in Dec 1914 in City Cemetery Ogden, Weber, Utah, United States. F iii Valine FARR-10428 was born on 10 Apr 1916. She died on 16 Oct 1988. M v Gordon Woolley FARR-10433 was born on 5 Dec 1919. He died on 15 Jan 2006. F vi Myrle FARR-10441 was born on 27 Jul 1921. She died on 8 Jun 2003. F vii Ida Nedra FARR-10443 was born on 30 Jan 1923. She died on 7 Feb 2005. M ix Elmo La Monte FARR-10445 was born on 18 Nov 1930. He died on 1 Apr 1988.